THE AMAZING SPIDER-MAN has been released in British cinemas this week so Slow-Robot is looking back to another "amazing" Spidey screen project: the SPIDER-MAN AND HIS AMAZING FRIENDS animated series. 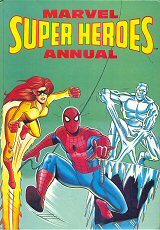 The Saturday morning cartoon, an early entry from Marvel Productions, premiered on NBC in 1981. It was conceived as a rival to the well-established SUPER FRIENDS series, featuring DC's A-list characters, which had aired on ABC since 1973. 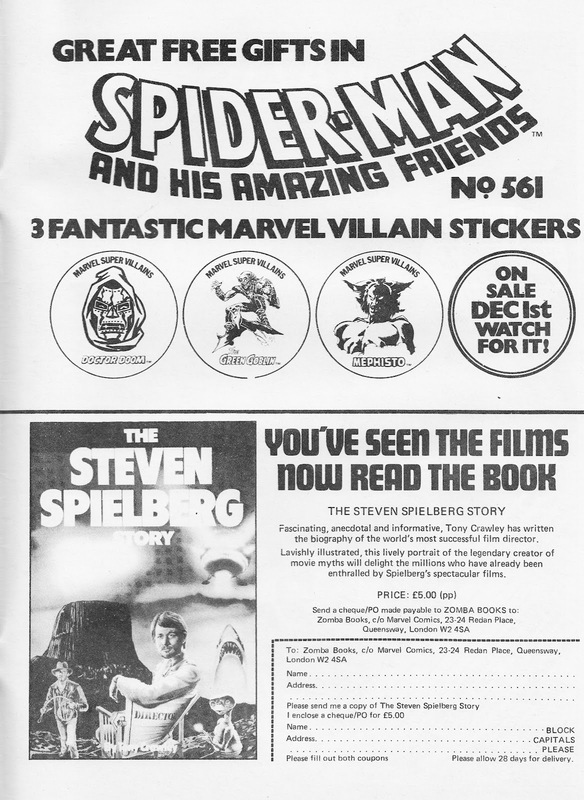 So blatant was the intention that Marvel's series had the working title 'Spider Friends'. The show, a regular Marvel Team-Up featuring Iceman and Firestar, took two years to reach the UK, finally arriving in the autumn of 1983. Marvel UK were primed to capitalise, and changed the name of their long-running weekly to coincide with the BBC ONE premiere. 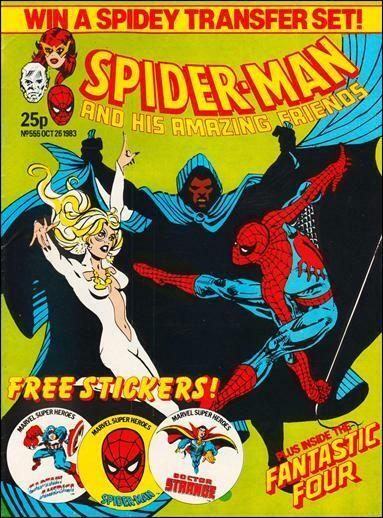 Unfortunately for Redan Place, Marvel US had done very little to tie-in with the TV show. 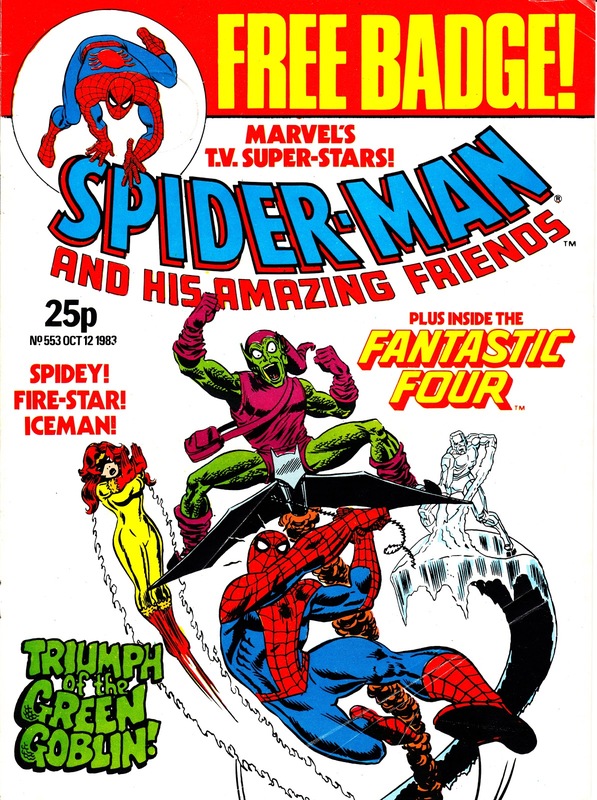 Their only direct tie-in was a December 1981 one-shot adaptation of the opening TV episode: Triumph of the Green Goblin (the TV episode itself borrowed heavily from the Revenge of the Green Goblin instalment of the 1981 syndicated Spider-man cartoon). Marvel UK serialised this one-off across issues 553-555 of the weekly, running it alongside their continuing in-continuity US reprints. 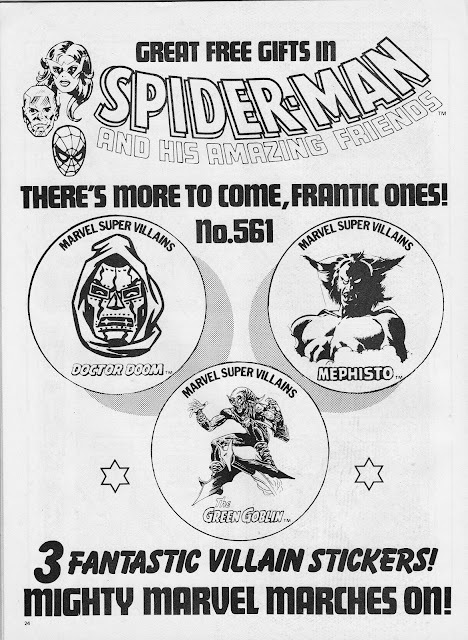 With the TV tie-in material exhausted, the weekly dropped all elements directly related to the TV show but retained the title (tenuously justified by various other heroes appearing in Marvel Team-Up reprints). The relaunch was accompanied with a run of free gifts (see House Ads below), all of which had been previously announced in the Bullpen Bulletins page as being the launch gifts for another, untitled and ultimately unpublished, weekly. 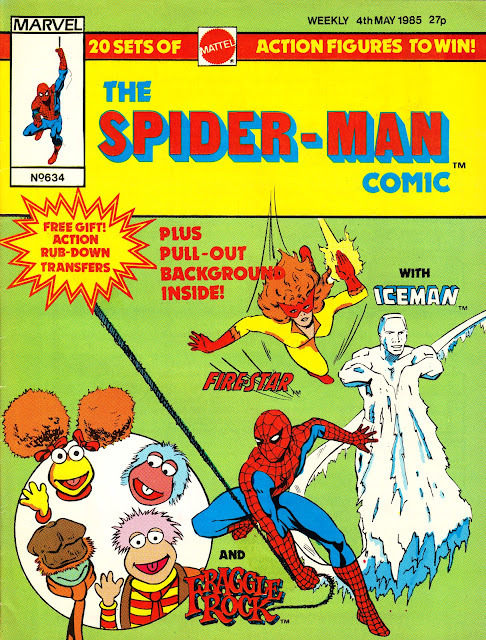 Ice Man DID start making regular appearances from issue 567 (18 January 1984) by virtue of the failure of THOR AND THE X-MEN (cancelled after 39 issues) and the absorption of both strips as Spider-man supporting features. 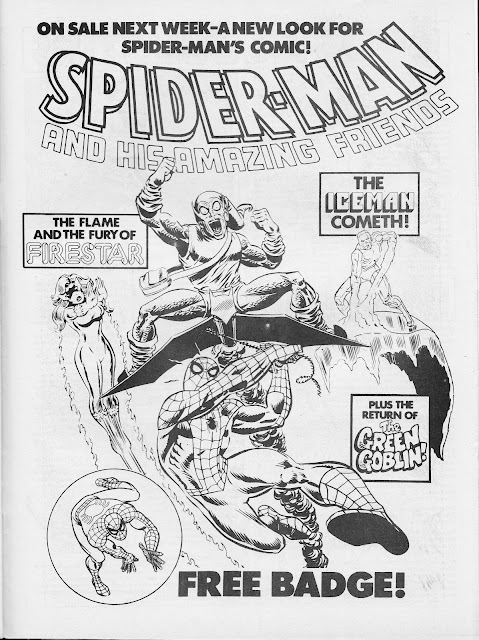 The Amazing Friends title was abandoned after issue 578 (4 April 1984), reverting to simply SPIDER-MAN. 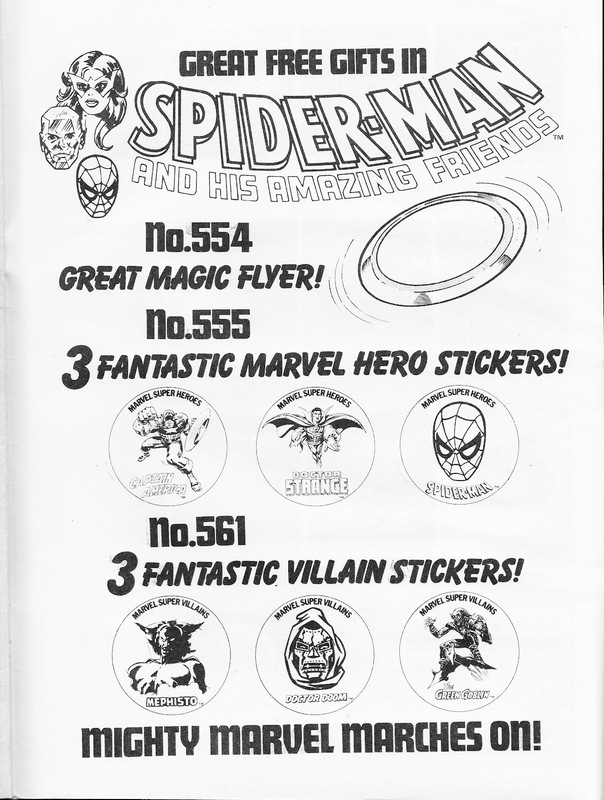 It was also used on the 1983 SPIDER-MAN WINTER SPECIAL although, again, the contents had no connection with the TV show. Surprisingly, Marvel UK never attempted to capitalise on the TV show by reissuing the Triumph adaptation as a special or annual. It eventually resurfaced in the MARVEL SUPERHEROES ANNUAL 1989. The 1984 ICEMAN limited series was initially announced as an upcoming reprint in SPIDER-MAN but eventually appeared in MARVEL SUPER-HEROES SECRET WARS. The 1986 FIRESTAR four issue limited series, placing the TV-created character into the Marvel Universe proper, was never reprinted by Marvel UK. Marvel New York did create two further contemporary Amazing Friends adventures although both only appeared as regional promotions in free newspaper inserts. 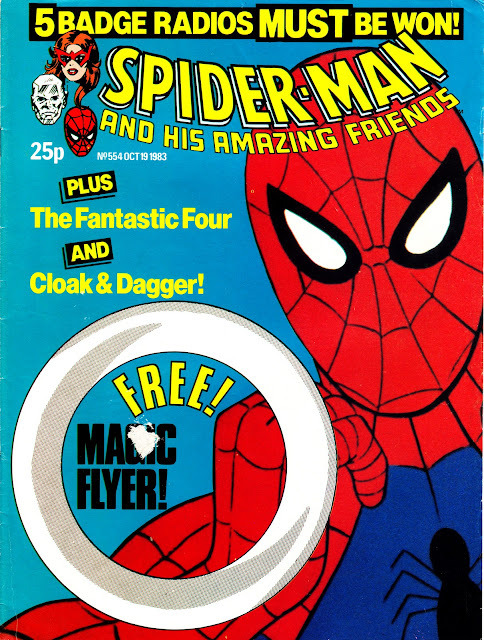 One of which, Danger in Denver (inserted in a 1983 edition of the DENVER POST) promoting a Denver department store, subsequently appeared in Marvel UK's THE SPIDER-MAN COMIC issues 634-635 (May 1985), the first of the new format for younger readers. The relative limited distribution of this story makes it fairly rare although the reproduction in the weekly (apparently taken from actual copies of the US original) is fairly poor. The other insert (with the DALLAS TIMES HERALD) promoted, of all things, a performance of the ballet The Nutcracker by the Dallas Ballet. Marvel UK, unsurprisingly, passed. As an aside, Marvel bundled reruns of Amazing Friends into their syndicated MARVEL ACTION UNIVERSE animation package (also featuring ROBOCOP, DINO-RIDERS, DUNGEONS AND DRAGONS, DEFENDERS OF THE EARTH, THE INCREDIBLE HULK and SPIDER-WOMAN) in 1988, leading to a further reprinting of the Triumph of the Green Goblin adaptation as a MARVEL ACTION UNIVERSE tie-in.